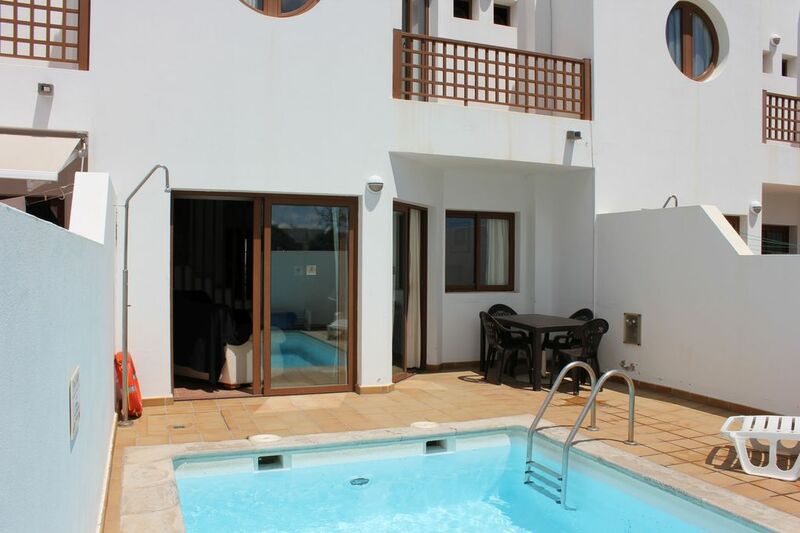 Great modern duplex townhouse with private pool in Costa Teguise, Lanzarote, good access to golf, beach and amenities. 3 bedroom, 2 bathroom with sea views in the Los Gurrupitos complex. The master bedroom has an en-suite bathroom. All bedrooms have fitted wardrobes. The kitchen is fully fitted, and there is also a utility room. In addition to the private pool, The complex has a large communal swimming pool, and a smaller baby pool. It is a 8 minute stroll from the centre of Costa Teguise, but there is also has a nearby supermarket for essentials. Due to popular demand we are pleased to announce we now have free 12 MBPS wifi internet access available at the villa. There is a 5x3 metre pool on the rear terrace, The house has a small terrace to the front and a larger terrace to the rear which surrounds the private swimming pool. Five minutes from water park and island golf course and eight minutes walk to Playa Bastian beach in Costa Teguise. More pictures are available, please contact us for the website address. Payment methods accepted : PayPal or Bank Transfer. WATER SPORTS: Lanzarote is ideal for water sports and boasts a good range. WINDSURFING - This is available from the beach Las Cucharas just a 100 meters away and has numerous places where you can hire equipment and have a great sail. SEA KAYAK and diving are also available here. KITE SURFING - is increasing growing here in Lanzarote and Famara beach is the main place not far from Costa Teguise. SURFING - best waves are either off East Coast Arrieta beach or Punta Mujeres or West Coast at Famara. You can have lessons and hire equipment at Famara. SAILING - For a day out sailing the prestigious Puerto Calero offers either private yacht or speed boat charters or a day out on a 80ft Catarmaran. FISHING - You can always go fishing either from Costa Teguise or go out on a boat from Puerto Calero. Water Park and Caves: Water Park is Situated 2 min from the apartment by car. (can be walked). A great day out for all the family. Sun beds to hire, lockers available. Open from 10:00am to 18:00pm. Other Activities Beach activities include Banana and Ring Rides & Canoe and Jet Ski Hire. Also wind-surfing lessons are available at the main beach. The house was well equipped, and in a great location with easy access into the town centre. Stayed here for 2 weeks in September and felt so at home. Prior arrangement regarding keys etc were spot on. Lovely villa, could do with a little update here and there and an outside working light would have been a bonus to find the keyhole in the dark. Pool was great and patio area was a suntrap although there was only 2 of us, i think 6 people in this villa would find it a struggle to place there beds around pool. Any problems we have were dealt with straight away, via Mark who was great. Villa is only 15 minutes walk from villa into town. Taxi only 2.40 Euros. Little Shop and Bar/cafe on site which did the job. Would deffo return sometime soon. The property was very spacious and clean, the pool although slightly overflowing on 1st day ( didn’t stop us using it ) was quickly rectified by Mark who was extremely helpful - The complex itself is clean with a larger communal pool and sun loungers, which was never overly busy. There is a very nice bar/ restaurant on site as well as a well stocked convenience store. Dionne and Terry were very helpful throughout the booking process. I would recommend this property and hope to return. Nice swimming pool to cool down in the heat & children had loads of fun, only ten minute walk to main centre were there are loads of bars & good restaurants for eating. Also just round corner from accommodation is a general store to stock up with basics & also a bar that also does food. Accommodation very spacious with three bathrooms. Would definitely recommend for families. First impressions as we walked in was great. Lots of room and fairly modern .then as we took the bags upstairs we noticed the walls up the stairs were all scuffed.. not a problem but that was the start of lots of issues with this villa. We tried to shut the blinds so we could get changed but apart from the blinds being ripped they wouldn't stay down all the way so we had to use pillows off the bed to block out light and get privacy. The bedroom and hall bathroom handles fell off the bedroom one causing my wife to fall over and bruising her leg and arm.it was reported to the maintenance guy but nothing was done..both upstairs baths were rusty and took a minimum of 10 minutes to get hot water so we used the downstairs bathroom which leaked out of the bathroom into the lounge. The fans in the bedrooms were thick with dust so we couldn't turn it on till they where cleaned .the tap in the downstairs bathroom only trickled .the outside area was dirty and needed a good clean.all four sun loungers where broken and dirty but just about useable. The drain was underneath the outside table and stunk everytime water was run.the pool on day two developed a greeny yellow fungus which wasn't sorted properly after I reported it. We waited in twice to get it sorted but instead of waiting again I cleaned the pool myself daily so we could use it but only really used it a few times as we were worried of it making us ill..
We didn't pay a Ritz hotel price but expected more than this. This was our 30th wedding anniversary getaway which will be remembered for the wrong reasons .. It's a shame as the villa with a good clean,minor repairs and a lick of paint would be lovely .its situated in a great area and only a 10 minute walk into town. This is a lovely spacious property, but it is starting to look a bit tired in areas. Location was ideal with lovely local bar right on your doorstep, short walk into the main areas of the town or 2.50 euros in a taxi. Just feel that the maintenance needs to be looked at, ie light bulbs, door handles and the damage in the baths. Costa Teguise lies on the sunny sheltered south east coast of the island of Lanzarote. An up and coming resort to the north of Arrecife, it has been planned and developed to a high standard and is where the Spanish royal family have a holiday home! There are excellent beaches and sporting facilities and this area is particularly good for windsurfing and scuba diving. The property is less than a 10 mins stroll from the golden sandy beach of Las Cucharas where windsurfing, snorkelling, scuba diving and other water sports are available. Costa Teguise has plenty of good quality restaurants, evening entertainment and a range of shops selling a variety of goods at duty free prices. The main beach known as Las Cucharas/Bastian, 640 metres long is protected by reefs and has fine toasted sand and clear calm waters which are safe for swimming and practising watersports. Close to the golf course (open to non members) + crazy golf and the waterpark at Acualanza. Rate are for 2 people. Extra person rates on request Children under 2 free. £100 deposit with booking, balance due 8 weeks before departure. WE HAVE ALSO REDUCED THE WEEKLY RATE FOR LIMITED TIME, BOOK NOW TO ENSURE THESE SAVINGS!